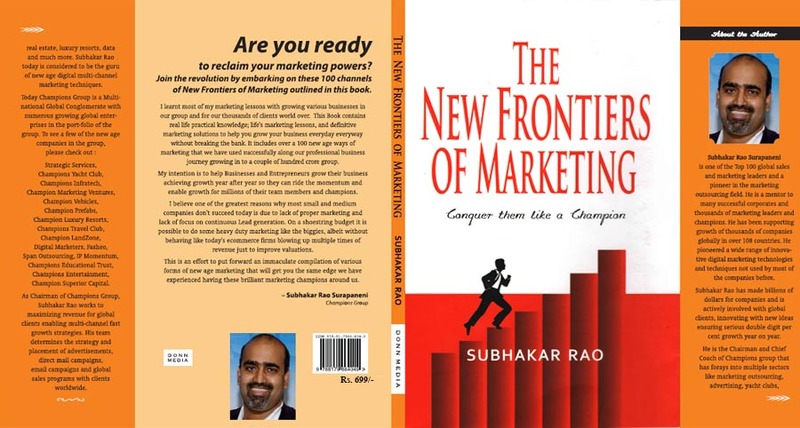 Subhakar Rao Surapaneni is the author of "The New Frontiers of Marketing" and also one of the Top 100 global sales and marketing leaders and a pioneer in the marketing field. He was recently listed as a Top 20 "Business Game Changer" by Fortune Magazine in Jan 2016. He is a mentor to many successful corporates and thousands of marketing leaders and champions. He has been supporting growth of thousands of companies globally in over 108 countries. He pioneered a wide range of innovative digital marketing technologies and techniques not used by most of the companies before. Subhakar Rao has made billions of dollars for companies and is actively involved with global clients, innovating with new ideas ensuring serious double digit per cent growth year on year. He is the Chairman and Chief Coach of Champions group that has forays into multiple sectors like marketing outsourcing, advertising, yacht clubs, real estate, luxury resorts, data and much more. Subhakar Rao today is considered to be the guru of new age digital multi-channel marketing techniques. As Chairman of Champions Group, Subhakar Rao works to maximizing revenue for global clients enabling multi-channel fast growth strategies. His team determines the strategy and placement of advertisements, direct mail campaigns, email campaigns and global sales programs with clients worldwide.